Designed to help solve the problem of a TV cabinet that is not quite level, and one of the doors constantly wants to slowly swing shut. Propping the door open with a wedge or a strut works, until someone forgets that the device is in place, and tries to close the door. Unless the device is spring loaded, or flexible in some way, something usually breaks……either the cabinet or the device. 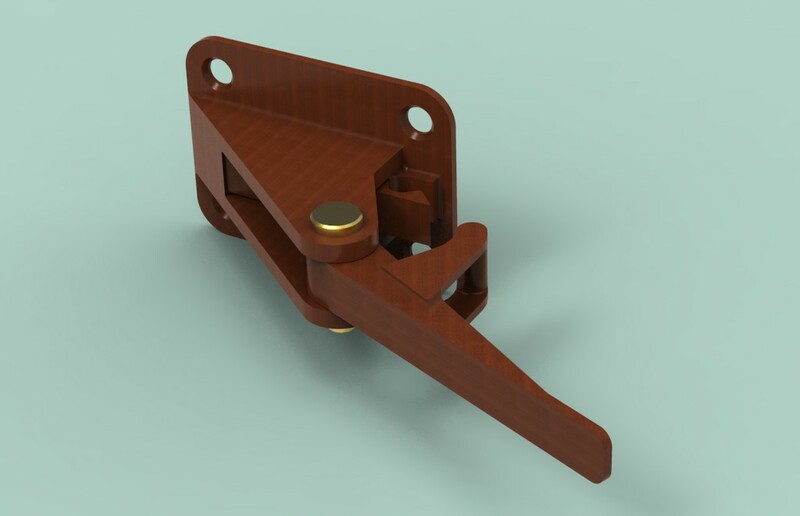 This door prop uses a snap lock that keeps the lever arm in place to provide just enough force to keep the door open, but if the door is closed, the lever snaps out of the lock and allows the door to close with no breakage. The lever can be easily reset by snapping back into the lock. Shown with 4 screw holes, but could be attached with a double sided adhesive strip.